Strawberry cream frosting on vanilla cake! It's strawberry season. I love the small extra sweet berries that you can find now, the ones that really taste like a strawberry. Back in May I came across a recipe in the BonAppetit R.S.V.P. section where readers write in about a dish that they love at a favorite restaurant. This particular cake is served at a place in Montpelier, VT. It was the frosting that attracted my attention. A strawberry cream cheese frosting sounds perfect and fresh for those early summer days. Butter and flour two 9-inch cake pans with 2-inch high sides. 3/4 cup chilled heavy whipping cream. 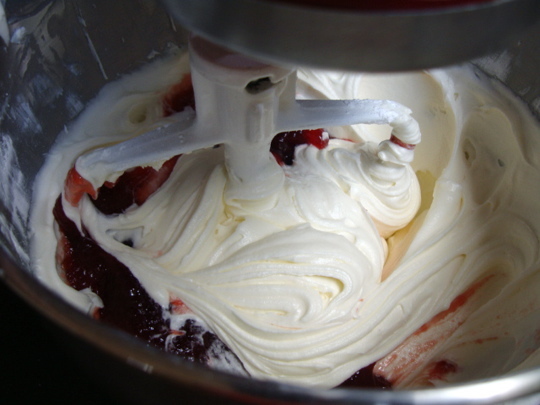 Using an electric mixer, beat cream cheese and butter in a large bowl until smooth, stopping to scrape down the sides. Beat in sugar, then jam. Beat cream in a separate medium bowl until peaks form. Fold whipped cream into frosting. Cover; chill until firm enough to spread, about 2 hours. 7 large eggs. Yes, 7! Using electric mixer, beat sugar and butter until fluffy. Add eggs one at a time, blending after each one. Beat in vanilla. Add sour cream; beat 30 seconds. Add flour mixture in 3 additions, blending after each. Divide batter between prepared pans. Bake for about 50 minutes or until cake tester inserted into the center comes out clean. Cool in pans on racks for 10 minutes. Run a small sharp knife around pan sides, then turn out cakes onto racks and cool completely. Using a large serrated knife cut each cake in half horizontally. Place one half, cut side up on cake plate. Spread 2 tablespoons of jam. Lastly, 3/4 cup sliced strawberries arranged in a single layer. Repeat two more times with cake layer, jam, frosting, and berries. Top with remaining cake layer cut side down. Spread two cups of frosting over the top and sides of cake in a thin layer to cover completely. Then spread remaining frosting over top and sides of cake. I refrigerated in between layers because my frosting was getting very soft. 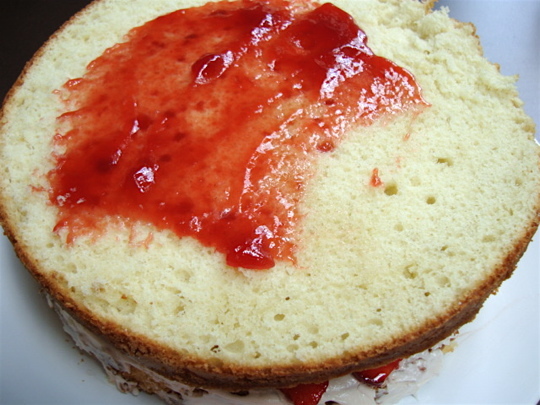 The recipe then says to take about 1/3 cup of the seedless strawberry jam and swirl it into the frosting decoratively. Afraid this would make it extra sweet, I skipped this part. I didn't save any berries to garnish with so I just used some flowers. The cake came out great, it was dense but moist and the frosting has that sweet tangy combination. Cover and refrigerate cake. As it sits in the fridge the cake soaks up even more moisture from the jam and berries but doesn't get soggy. Yum!